On June 30, HEC Montréal signed a co-operation agreement with the Tsinghua School of Economics and Management in Beijing, the fruit of discussions between the two institutions begun in 2004. The final terms were worked out and the agreement ratified when HEC Montréal Director Michel Patry visited China. The agreement provides for student exchanges between the two institutions at the undergraduate and postgraduate levels, starting in 2009. The Tsinghua School of Economics and Management was founded in 1984 and is now considered the country’s top business school. 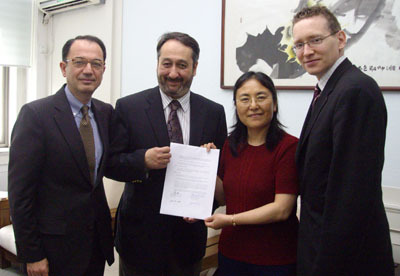 It was the first school in China to be accredited by EQUIS (European Quality Improvement System), in February 2008, and AACSB (Association to Advance Collegiate Schools of Business), in 2007. This summer, 25 MBA students took part in a Campus Abroad trip to China, visiting businesses and factories and talking with company directors and managers. This kind of trip, lasting a few weeks, gives students the opportunity to soak up local business culture and develop business relationships that can prove useful later in their careers. This fall, HEC Montréal will be offering a new Introduction to Business Chinese course for students in all programs. The focus will be on learning the language and using Mandarin in a professional context. Students will also have a chance to learn about Chinese culture. HEC Montréal has been present in China for 25 years, cultivating close ties with the university and business communities there. The School has become one China’s important partners in education for training managers and international exchanges. Since 1983, the School has welcomed Chinese students into its graduate and postgraduate programs year after year, and conducted a growing number of training activities in China. In 1998, HEC Montréal joined forces with a number of major Quebec and Chinese firms to offer a first graduate diploma in energy sector management. Since then, the School has earned an excellent reputation in this sector, training hundreds of Chinese managers. From left to right: Hassan Taghvaï, Regional Director, International Projects and Michel Patry, Director, HEC Montréal, June Xiaojun Qian, Associate Dean, Director of Programs, Tsinghua School of Economics and Management (Tsinghua University), and Sylvain Landry, Director of International Projects, HEC Montréal.